Please join us Friday, February 12 for an evening with Gabie Strong, Christopher Reid Martin, and Ted Byrnes. Themes of catharsis and cleansing will lead into a sonic space to prepare us to dream and, ideally, to heal. Between 10pm-midnight, Gabie Strong, Christopher Reid Martin, and Ted Byrnes will activate the space of Baik Art. For an optimal experience, be prepared to lie down. An intrepid group will spend the night following the performance in the ancient Greek tradition of ‘incubation’. Your dreams will be interpreted the following morning by a professional. Please email Matt Wardell at shonufwardell@hotmail.com to reserve your spot. BYOB (Bring Your Own Bedding). Details of the overnight stay will follow. Space is very limited!! Gabie Strong is a California artist and musician exploring spatial constructions of degeneration, drone and decay as a means to improvise new arrangements of self-reflexive meaning. Strong uses sound performance, radio broadcasting, environmental installation, photography and video as mediums for experimentation. Her work has been presented on Kchung TV at the Hammer Museum’s Made in L.A. 2014 biennial exhibition, Pasadena Armory Center for the Arts, Knowledges at Mount Wilson Observatory, Pitzer Art Galleries, University Art Gallery UC Irvine, and LAXArt amongst others. Strong has performed at MOCA, the wulf, Los Angeles Contemporary Archive, Printed Matter’s LA Art Book Fair, Art Los Angeles Contemporary, Human Resources, SASSAS, LACE, High Desert Test Sites, LACMA, the MAK Center for Art and Architecture, Jabberjaw, and with her all-female free-psych band Lady Noise for Dawn Kasper’s performances at the 2012 Whitney Biennial. Strong’s work is an exploration of the affect of decay that is experienced from living in the spatial disorganization of the twenty-first century. This disorganization is the result of living in multiple non-places at once—both physical and virtual— where borders are both confining and permeable. In 2010, Christopher had taken his creative endeavors into other avenues, releasing tracks under various formats under his shared Orange County based label Via Injection. Christopher's creative repertoire expanded when he began documenting his experience in countries outside the US, by taking field recordings, foreign radio recordings, and/or taking photographs. Photographs were either left unadulterated as they were taken or digitally manipulating and layered these with old scanned various schematics. This has lead to an ongoing body of work, which fuses reality in the form of photography, with corroded ideas in the form of chopped manipulated grids and manuals. Christopher has and continues to show work in a number of art shows and has performed live in a number of events in projects such as Bailouts, Via Injection, Shelter Death, and under his own name. Ted primarily works in ad hoc improvisational settings, but has standing improvisational groups including: a group with Ulrich Krieger, a duo with Jeff Parker, a duo with Chris Cooper (AQH), a duo with Nicholas Deyoe, a duo with John Wiese, a duo with Scott Cazan, a trio with Jacob Wick and Owen Stewart-Robertson, among others. Additionally, Ted has played in duo/trio/or ensemble settings with: Mazen Kerbaj, David Watson, Ingebrigt Haker Flaten, Charlemagne Palestine, Alfred 23 Harth, Tim Perkis, Jaap Blonk, Torsten Muller, Kim Myhr, Jim Denley, Lloyd Honeybrook, Chris Schlarb, Mike Watt, Paul Masvidal, the LAFMS (including Smegma, Airway, Ace Farren Ford’s Artificial Art Ensemble, Rick and Joe Potts, Fredrik Nilsen, Tom Recchion, Vetza, etc), Sissy Spacek (the band), Maher Shalal Hash Baz, and more. Ted has also collaborated with / worked for a variety of visual artists: he has accompanied a Doug Aitken “happening”, collaborated with Olivia Booth to play her glass artworks, collaborated with Dani Tull on a sound performance, performed with John Knuth and Bret Nicely at an installation in an empty pool, and has performed for FLUXUS artist Jeff Perkins on multiple occasions for his projector/light installations. Currently, Ted is delving further into the possibilities and realities of solo drumset performance in addition to continuing to work with his existing projects. Baik Art presents EYE-DEE-QUE (Something Like an Asclepeion), a solo installation and series of events by Los Angeles artist Matt Wardell. For the exhibition, Wardell will present an immersive environment of images and objects by channeling ‘something like’ an ancient Greek temple of healing. Using Baik Art’s unique architecture, viewers experience a literal (and perhaps figurative) katabasis (‘to go down’ as in a descent of some type), but more importantly, and ideally, a catharsis (‘cleansing’ or ‘purification’). Numerous objects, found and constructed, engage with the verticality of Baik Art’s shaft-like space, surrounded by an installation of wall works including drawings, collages, and repurposed images. Several fabric sculptures fill the gallery functioning as apotropaic totems. These Guardian Figures suggest a ‘presence’, ideally something beyond the object. Daytime and evening events will further activate the gallery a space for healing. Practitioners from a variety of fields will be on hand for consultation. Music for Healing or What You Need will present a sonic cleansing. Incubation and Dream Analysis will be an overnight event of guided sleep followed by dream analysis with a professional. Utilizing the healing properties of dog saliva, An Event for Wound Licking will be a participatory event pairing wounds with dogs. For the date and time of each event, please contact the artist at shonufwardell@hotmail.com. 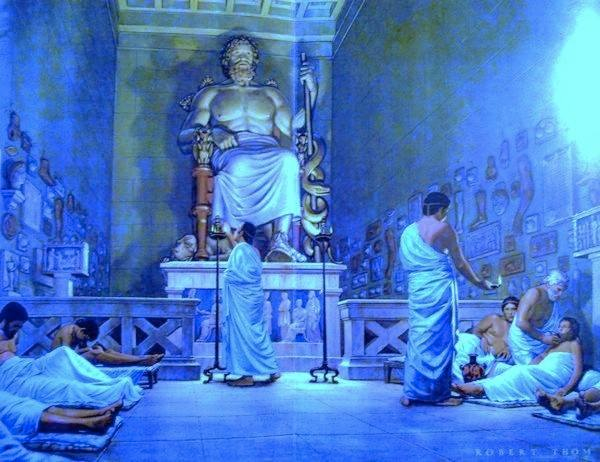 In ancient Greece and Rome, an asclepeion was a healing temple, sacred to Asclepius, the Greek God of Medicine. These temples were places in which patients would visit to receive either treatment or some sort of healing, whether it was spiritual or physical. Epidaurus was the first place to worship Asclepius as a god, beginning sometime in the 5th century BCE. Starting around 350 BCE, the cult of Asclepius became increasingly popular. Pilgrims flocked to asclepieia to be healed. They slept overnight (“incubation”) and reported their dreams to a priest the following day. He prescribed a cure, often a visit to the baths or a gymnasium. Since snakes were sacred to Asclepius, they were often used in healing rituals. Non-venomous snakes were left to crawl on the floor in dormitories where the sick and injured slept. Matt Wardell seeks to prolong a sense of wonder while placing the viewer in a lingering position of active assessment. He is interested in how we choose to live and in introducing work that facilitates these investigations. Wardell enjoys walking on fences, answering wrong numbers, and giving directions to places he does not know. Uncomfortable laughter, confusion, and irritation tend to be the byproducts of Wardell’s works. Wardell has exhibited his work at venues throughout the United States and Mexico, including the Museum of Modern Art in San Francisco (SFMOMA), Claremont Museum of Art in Claremont, Los Angeles Contemporary Exhibitions (LACE), REDCAT, PØST, Human Resources, Black Dragon Society, Mark Moore Gallery, and Commonwealth and Council, all in Los Angeles. Wardell is a founding member of the artist collective 10lb Ape.